Cleanroom Validation, Particulate Count, Air Sampling, Air Velocity test, DOP test, HEPA filter Integrity test, Aerosol photometer, Indoor Air Quality Analysis, HEPA FILTERS, Micro Fine, Pre Filters, Mini Pleat Filters, Metallic Viscous Filters, Air conditioning filters. Manometers are made of thick acrylic plastic solid block, vertically unbreakable stable and free of distortion. PVC plastic engraved scale, zero adjusting knob, level bottom and panel mounting holes provide with manometer. Being the foremost names of the industry, we are engaged in offering an extensive range of Digital Anemometer to our honored customers. Our products are made by experts utilizing the advanced technology and best quality component, which is attained from dependable merchants of industry. Owing to high demand, our product is available in the market in diverse configurations. 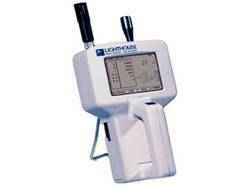 We are the leading firm of Lighthouse Handhold Particle Counter. These are developed by professionals employing the top quality component, which is procured from dependable merchants of market. To sustain the quality, our product is developed under the direction of industry professionals. In addition, we are delivering to our customer’s sites within given time period. We are a well-known name, which is engaged in providing the top range of Hot Wire Anemometer. This product is extensively demanded by our patrons and employed to measure the air velocity and temperature at the same time. This (Lutron-AM–4204) is rigidly examined on numerous quality parameters to provide a defect free series in the market. Our product is extremely employed by patrons due to their longer working life, top performance and strong nature. 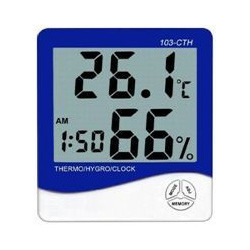 Backed by a diligent team of capable experts, we are involved in delivering an extensive range of Digital Thermo Hygrometer. Our range is available in diverse configuration that meets on patrons demand. In addition, our product is examined on diverse industry norms to make sure the longer service life and top performance. In addition, we present this product at nominal costs to our customers. 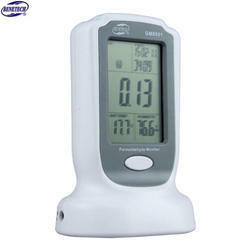 Big Display Thermo / Hygrometer with Clock large 2 line LCD display. Formaldehyde testing is one of our finest services. 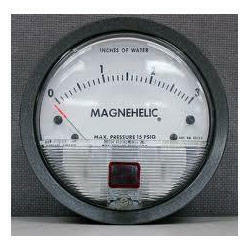 We are one of the renown manufacturers and suppliers of Magnehelic Gauge. We provide this to our customers at the best reasonable prices. (0-60 pascals ) - Dweyer & Aerosense Brands available .